The gate is where it all comes together in injection molding. Mold design and part design. The molten resin and the solid molded product. Aesthetics and mechanical performance. Skillful decisions about gate style, location, and size early in the mold and part design process can pay big dividends when it is time to start molding parts. And the benefits pay off in greater part performance and reliability. The gate on an injection molded part leaves a “witness,” or a vestige, where the part is separated from the runner system. This is considered an appearance defect and is typically hidden in an area of the part where it will not be obvious. In addition to causing cosmetic defects, the gate can affect mechanical properties of the resin. As the flow enters the gate at high pressures and temperatures, the gate can be a source of molded-in stress. Since it has the longest heat history (it is the last to cool), resin in the gate areas is far more susceptible to inferior mechanical properties compared to the molded resin out in the cavity. Therefore, the part surface in the gate area is far more likely to include defects that can behave as stress concentrations during tensile loading or drop testing. Customers who mold parts with Eastman Tritan™ copolyesters for medical and durable goods applications generally use one of these gate styles. We provide a brief description of each style here and will dive deeper into the pros and cons of each style for molding Tritan in a future blog. If you’d like to receive an email when this blog posts, contact us. confined to the auxiliary tab, which is trimmed off after molding. entire length or width. Frequently used with acrylics and flat designs where warpage must be minimized. • Hot runner (hot probe) gating—Used to deliver hot material through heated runners and electrically heated sprues. hot runner systems when molding Tritan to avoid sticking and improve part aesthetics and performance. concentricity is important and a weld line is objectionable. machined from the end of the runner to the cavity. Since the gate is a focal point for both inherent and applied stress, putting one in the wrong place can produce parts with inferior functionality and reliability. Generally, the gate should be placed so it will not affect the processing efficiency or structural integrity of the finished part. • It should not be placed where internal molded-in stresses might relieve themselves over time. • It should not be placed in areas that will experience high tensile loading in its end application. pressure required to fill the cavity, optimizes wall thickness necessary for easy molding, and reduces part cost. location can determine where weld lines will form. This should be considered early in tool design. on the surface. For example, Eastman recommends avoiding hot runner valve gates that are smaller than 1.02 mm (0.040 in.). For more information about gate design recommendations, contact an Eastman customer service representative or download a copy of the Eastman Tritan™ copolyester Processing guide. The medical industry has a great and growing demand for innovative soft-hard designs in devices, housings, and other equipment. A recent advance in liquid silicone rubber (LSR) technology makes it easier to satisfy this demand with medical grades of Eastman Tritan™ copolyester. Transparent and opaque formulations of medical grade Tritan also feature a lower Tg and require a lower processing temperature than some engineering polymers—a potential challenge to achieving strong in-mold adhesion with elastomers. Momentive Performance Materials, a leader in LSR solutions, recently introduced a self-bonding LSR technology specifically for one-step overmolding of silicone to Tritan medical grades. This is the first commercially available process of its kind and is tested against USP Class VI and/or ISO 10993 biocompatibility standards. The Momentive Silopren* LSR 47x9 series provides strong in-mold adhesion with Tritan without the need for primers. It also cures rapidly at relatively low temperatures—hitting the sweet spot for achieving functional performance and efficient processing with Tritan medical grades. The combination also demonstrates excellent adhesion strength, as summarized in this table. 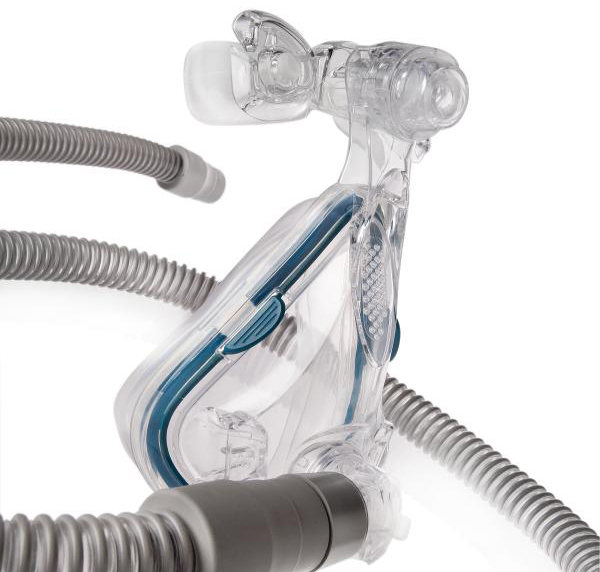 For more information about how to optimize overmolding with Tritan medical grades, contact an Eastman Technical Service Representative. To design greater manufacturability into molds—and parts—it’s critical to achieve the most effective fill pressure, to anticipate the fill pattern, and to predict volumetric shrinkage. Eastman Design Services uses mold-filling simulation to evaluate the “moldability” of the part design and engineering resin combination. Fill pressure and fill pattern go hand in hand. Just as mold design is inextricably linked to part design, reasonable fill pressure and reasonable fill pattern should be evaluated together. When creating mold-filling simulations for Tritan, we start at 15,000 psi or less, before runner systems are added. This provides a form of “insurance” that allows for the additional pressure drop added to the overall system pressure will not exceed the molding machine’s capability to push the plastic. Reasonable fill pattern—using mold-filling simulations can help determine the right fill pattern up front, and reduce costly modifications after tooling construction. 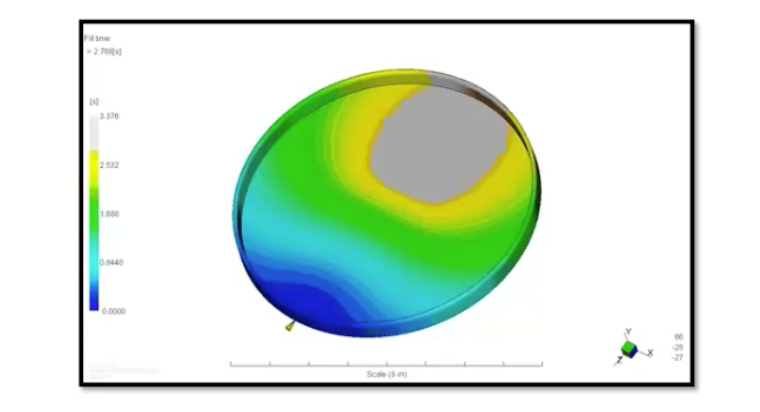 Our simulations can identify potential problems such as flow front hesitation, air traps, and volumetric shrinkage—all of which can result in cosmetic defects and undesired stresses on the part. ​These two images above show the identical part gated on opposite ends. Both are approximately 4x3 inches with a thickness of 100 mils. Both have an arm off the side that is about ½ as thick (50 mils). and freezes. After filling the rest of the part, it tries to backfill the arm, but cannot fill it efficiently, resulting in a short shot. • In the example on the right, it fills the thicker section and flows right into the thinner section. To demonstrate an air trap, we show a plate-type application with a thicker outer rim and requires an aesthetic, unblemished surface across the face. You see the melt advancing faster around the rim, basically cutting off your ability to vent the face. With a highly transparent resin like Tritan, this will result in appearance defects. We discuss possible solutions to these problems as well as the effect of volumetric shrinkage in a thick-walled part in our free webinar, Improving moldability through part and mold design. The pressure is on you to resolve problems early in the process. It can be very costly to make changes after the mold is constructed. Eastman can use mold filling simulation to help identify fill pattern pitfalls and establish reasonable fill pressure early in the process—for fewer headaches when the pressure is on. To see fill patterns animated, contact an Eastman Customer Service Representative. For more information on reasonable fill pressure and fill pattern see the dedicated pages at TritanMoldIt.com. Brand owners and design engineers continue to find new ways to use Eastman Tritan™ copolyesters in a wide range of food contact and non-food contact applications. Starting with your specific needs, Eastman can provide technical expertise and support to help determine the best grade of Tritan for your application. Table 1 compares the properties of the three most popular grades of Tritan for durable goods. All three grades exhibit excellent clarity, durability, hydrolytic stability, and good heat and chemical resistance. In addition, Tritan TX1001 and Tritan TX2001 have a mold release derived from vegetable-based sources. TX2001 is excellent for thick parts. Tritan TX1501HF provides viscosity reductions of 40%–50% relative to TX1001 and is well suited for long flow length, in-mold decoration, and in-mold labeling. To learn more about Tritan grades for durables, check out the Durables section at TritanMoldIt.com or download Take your housewares from concept to countertops. Join us March 18–21 at IHHS in Chicago—we’re at booth S4875. Thermal control is critical for injection molding Eastman Tritan™ copolyester. Keeping temperatures cooled below the heat deflection temperature (HDT) of Tritan helps ensure successful demolding with no dragging or sticking of parts. Preparing a cooling strategy early in the tool design process can pay big dividends in cycle time and processability. One key to keeping it cool—just add water. It’s not that simple. But providing ample and well-positioned cooling water channels is critical to controlling the temperature of the cavity surface and the resin in the mold. Here’s why controlling resin temperature is important: as the resin approaches HDT, it becomes sticky (the coefficient of friction increases) and parts cannot be ejected efficiently. NOTE: Excess heat over time also reduces molecular weight and degrades a polymer’s properties, as addressed in Mold design—critical factor #1. To remove heat more efficiently, baffles and bubblers may be used to generate turbulent water flow within the core steel. In areas of the cavity where the part geometry makes it difficult to place cooling lines near the molten plastic, Eastman often recommends an alloy with a higher heat transfer coefficient. An alloy such as steel/copper can extract excess heat more quickly and help improve good part quality and appearance. • Run the cooling circuit as close to the gate as possible. • A water-jacketed gate often works well. • For a hot-gated system, we recommend a valve gate that uses a mechanical shutoff rather than a thermal shutoff. • Consider using an independent water supply for the gate area. This lets you control gate water temperature independent from cavity cooling circuit—and can help improve processability and gate aesthetics. Keep the tool cool beyond the cavity surface. Involve Eastman early—and keep us in the loop. The Eastman Design Services group can be a great asset during the tool build. We can review your plans and make sure your mold will give you the best results from Tritan. Questions about temperature control and cooling techniques? The Tritan Experts and the Eastman Design Services group are ready to help you find the answers.